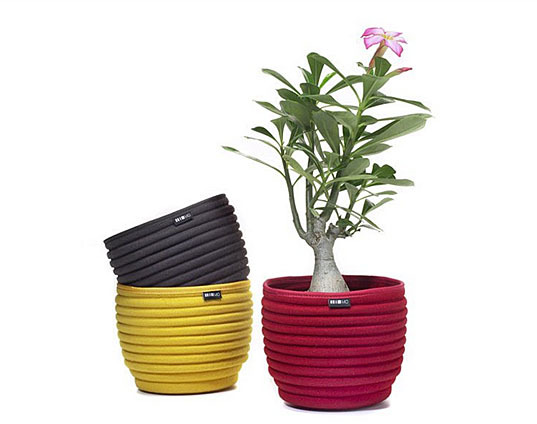 If you’re looking for a more eco-friendly alternative to ceramic pots for your windowsill garden, these wool felt pots offer an artful way to outfit your plants. Each Beehive Bowl is made from 100% wool felt and is handcrafted at one of the last remaining millineries around. Available in an array of colors, each sturdy shape is soft to the touch and uses only one tenth of the energy it takes to manufacture ceramic pots. A great way to green up a space! This is a nice blog message, I will keep this idea in my mind. If you add more video and pictures because it helps understanding :) ml Tetuokudo. If you're looking for a more eco-friendly alternative to ceramic pots for your windowsill garden, these wool felt pots offer an artful way to outfit your plants. Each Beehive Bowl is made from 100% wool felt and is handcrafted at one of the last remaining millineries around. Available in an array of colors, each sturdy shape is soft to the touch and uses only one tenth of the energy it takes to manufacture ceramic pots. A great way to green up a space!